Our office knows that in today's economy, that patients are looking for quality dentistry at a reasonable price. We understand patients want a trustworthy Dentist who is compassionate, caring and, above all, gentle! We also understand that it may have been a while since you visited the Dentist and we offer GUILT FREE examinations when evaluating your dental concerns. Dr. Hayes is experienced in general and cosmetic surgery such as crowns, bridges, porcelain veneers, bonding, implants, extractions, tooth colored fillings, teeth whitening, root canals and all other types of dentistry. Dr. Hayes ensures that her patients always receive the latest, most effective treatments possible and to deliver those services with pain-free techniques. 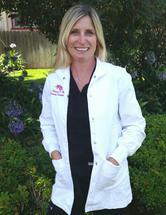 Dr. Hayes is skilled at providing anesthesia in a way that minimizes pain and or discomfort.